(Pacific Palisades, CA; October 13, 2009) – Cosimo Pizzulli, internationally known designer and fine artist, can now add winemaker to his long list of impressive credits. Today, Pizzulli announced the official launch of Pizzulli Family Winery with his first commercial release of 2007 Sangiovese handcrafted from grapes sustainably farmed and hand-picked in Los Alamos Valley Vineyards in Santa Barbara County. Pizzulli’s 2007 Barbera and 2007 Nebbiolo will be released later in the year. Pizzulli is not new to winemaking. In 2003, he planted Sangiovese vines in a half-acre hillside vineyard located on the grounds of his Pacific Palisades home. A few years later, Pizzulli produced his first wine from those vines in a wooden shed across the driveway from his house. Inspired by fond memories of making wine with his grandfather in Brooklyn, Pizzulli is continuing the tradition of crafting small lots of Italian varietals handed down through the generations of Pizzulli family winemakers, from Puglia, Italy to the Central Coast of California. A photo of Pizzulli’s grandfather graces the wines’ labels. 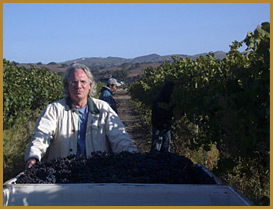 Pizzulli Family Winery’s artisanal Cal-Italia wines are well-crafted with modern state-of-the-art techniques and a certain Old World style, a contemporary wine influenced by what Pizzulli’s ancestors most likely produced in Italy in the 1700s. “Wine is first and foremost a beverage to be served with food. It’s important to me that my wines are food friendly,” says Pizzulli. Pizzulli considers his wine another work of art, given the same passion and attention that goes into literally everything he designs. When asked what most motivates him, Pizzulli says, “I really pay attention to all of the sensual arts, including painting, sculpture, music…even food presentation can be inspiring and, of course, wine, the way it looks, smells, and tastes.” Pizzulli’s lifestyle revolves around hospitality, whether he’s creating an inviting seating arrangement or gathering friends to his home for an evening of wining and dining. Considering the very limited production of Pizzulli Family Winery’s initial releases, the primary target for sales is Los Angeles-based restaurants and wine shops. In fact, the 2007 Sangiovese was immediately embraced by some of the restaurants that Pizzulli designed, including Enoteca Drago in Beverly Hills and Il Ristorante di Giorgio Baldi in Santa Monica. “It’s a perfect fit. My wines poured in restaurants that I designed,” says Pizzulli. Pizzulli’s goal is to continue producing small lots of the wines that he most likes to drink, increasing production slightly as the wines gain a following. The focus will remain on Italian varietal wines, Sangiovese, Barbera and Nebbiolo with the introduction of an unique Piedmonte-inspired Rosé in 2010.